On Sunday Dave and I made plans to go to Rino’s, and it’s all I’ve been able to think about. I’ve turned down at least four different foodstuffs in the past few days in anticipation of truly gorging myself on their lobster ravioli. But yesterday afternoon (at a beat-the-crowd 5pm) we found ourselves at the hostess desk being told there were already 8 parties ahead of us, and thus no hope of eating any time soon. I was crestfallen. Undaunted, Dave escorted me a few blocks away to Mario’s Ristorante. Open the double doors, and welcome to your Italian Grandma’s kitchen. A quick snapshot of the ambiance: the sole waitress made a phone call during which someone on the other end asked if she was busy. “Four tables,” she said, then chuckled “and of course, the free-loader” gesturing to a man eating alone at a table. Next to him, another woman (maybe the owner, Ursula?) played with his child. “Is it almost time for you to go home, take a bath, put on some feetie pajamas?” she asked the little girl. Dave and I both agreed that sounded like an excellent plan for the evening. 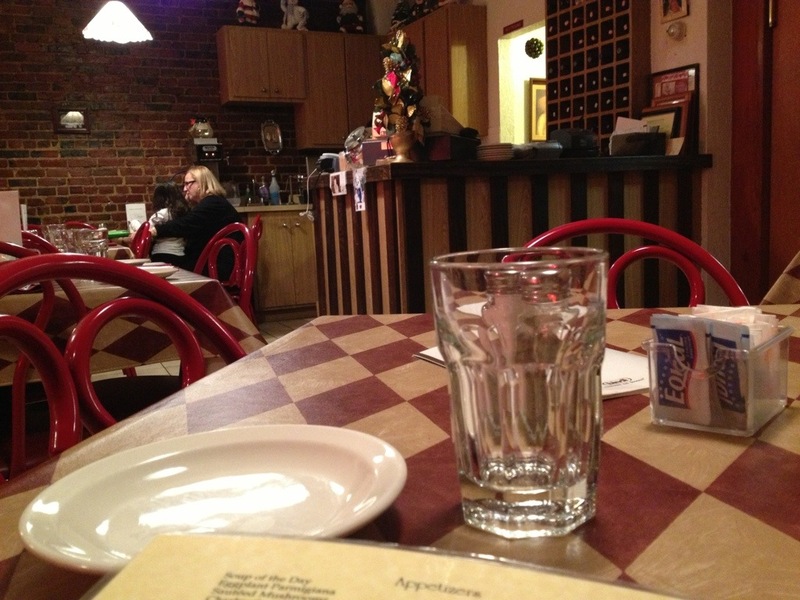 Mario’s hasn’t had Rino’s recent slick renovation, and their dining room seems a bit larger and unjustly emptier. But the atmosphere is cozy and warm, conversation at one table often extends to the next – or the whole room- and you can tell everyone is family here. When the “free-loader” (clearly a beloved regular, or maybe actual family) and his daughter left, the little sprite wished every single patron Merry Christmas, AND a happy new year. Proud of her, the waitress remarked “isn’t she something?” and really, she was. This kind of thing doesn’t happen at Rino’s. And the food? Equally as impressive. Charbroiled sausages for an appetizer had just enough fennel, and were served with wrinkled, salt-cured olives. Veal Alla Ursula – scallopini breaded and pan fried, topped with eggplant, mozzarella cheese and tomato sauce, was not oily in the least. The scallopini was thin, tender, and flavorful, topped with a thin layer of crunchy eggplant. The red sauce was scarpetta worthy. Before I ordered, I notice the waitress eating a dish with wide noodles, something that didn’t appear to be on the menu. (I have a weirdly accurate eye for noodles.) I asked her what her favorite dish was, and she named several and then said “also tonight, we have a pappardelle with bolognese” – clearly what she had been eating – and I was sold. It was perfect. The sauce was creamy and flavorful, full of veal and pork, topped with parmesan and one basil leaf. The noodles were an Italian al dente, just soft enough to curl around a fork. The smooth house Chianti was just icing on the cake. As we left, everyone in the dining room wished us a Merry Christmas, again. I felt like I was leaving my relative’s house – I half expected Ursula to force ricotta pie on us – and I can’t wait to go back.